Now available from Orbit Communications , the second generation BodyGuard collision avoidance system provides an important layer in risk management systems as it lowers the risk of collision between vehicles and personnel. The BodyGuard collision avoidance system operates by producing an invisible “shield” (detection zone) around the vehicle that gives the operator an audible and visual warning when anything penetrates the detection zone, thus posing a potential collision risk. The detection zone of the BodyGuard collision avoidance system is field programmable from around 3m to over 100m to suit individual applications. In applications where risk of collision is at close range, such as between personnel and forklift, the detection zone may be set around 3 to 5m from the vehicle. Alternatively, for situations where the warning distance for possible collision needs to be greater due to fast moving vehicles or requirements for larger clear zones, such as haul road mining trucks in open-cut mines, the detection zone can be programmed up to 100m or more. 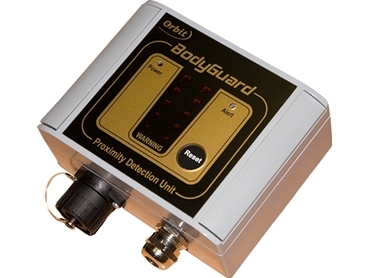 The BodyGuard collision avoidance system is housed in a solid IP67 waterproof rated enclosure, suitable for outdoor mounting, and is supplied with a three year warranty.